ADDIS ABABA-Inaugurated on September 25, 1987, the Department of Orthopaedics in Black-Lion Hospital this week accepted 10 new residents totaling the number of specializing residents 100-a huge number! Twenty six candidates will complete their specialty training at the end of this month and 8 of these who took the COSECSA International exam this month held in Rwanda have passed successfully. Dr. Helawi is one of the examinees and chief residents. He said, “This is a great achievement as a nation indicating the quality of training here is competitive to standards. Amidst increasing Road Traffic Accidents, great news to know in a few weeks our country gets 26 additional Ortho-surgeons, out of which two are females graduating. 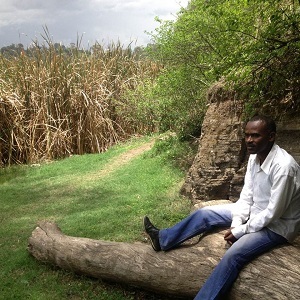 There are residents from Sudan and Somalia as well. Dr. Biruk Lambisso, Associate Professor and Consultant Surgeon disclosed that a new Sub-Specialty program also started this year. This sub-specialty in Orthopaedic trauma is the first of its kind in Ethiopia. After formal/general specialty training of four years, candidates take another two years of Trauma/injury focused high standard sub-specialty training. He noted the department, using its state-of-the-art facility gives outpatients, in-patients and surgical service, trains specializing residents, teaches medical students, residents and fellows. It also conducts musculoskeletal research. There are nationally and internationally funded projects of significant impact. An example of such project is the “Permanent Disability Rating Software development” project fully funded by MINT. 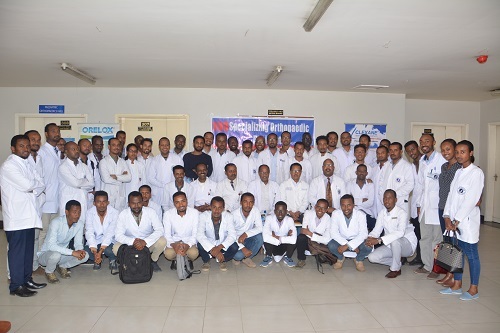 He further noted staffed with 16 senior/consultant Orthopaedic surgeons and vibrant young residents in training, the department is a leading mother institution in extremity and spine care in Ethiopia. The Department has helped the birth of three other similar departments in different parts of the country, two more in the pipeline. The Department receives referred fracture/trauma patients, emergency and all regular musculoskeletal conditions from all over the nation. At this juncture, the Department has developed three more different curricula: Sub-specialty in Pediatric Orthopaedics, Ms.C in Prosthetics & Orthotics and Doctor of Physiotherapy. These go hand-in hand. Dr. Biruk went on to say, the Department was very busy due to instability in some places. Staff members had been deployed to such strife-torn areas in the country to treat the injured and the displaced. Orthopaedic is an expensive care. Modern implants and instruments are costly. Hospitals usually fall short of budget to purchase such equipment. Sometimes a good facility with a capable Orthopaedic surgeon may not help the injured people due to lack of implants and instruments. Our Department has strong international collaborations with organizations like: SIGN, ADFA, AO, WOC and SAO. That is how it survived for three decades. But, even then, we still lack equipment like C-arm. Once damaged, maintenance of donated equipment is a challenge. New ones are very expensive. In the presence of a good number of highly trained surgeons, it is possible to avoid unnecessary referrals for surgery abroad-saving the country’s scarce hard currency. That is why in the future, the department focuses more on sub-specialty training, he concluded. It is learnt that the department of Orthopaedics is dealing with serious emergencies such as complex fractures from car accidents, construction site injuries, machines falls, among others. Around 2,500 major surgeries are usually performed every year. Over 75% of our work is trauma related. Over 31,000 patients are treated at OPD. Tumors, MS-Infections, degenerative conditions, chronic low back pain conditions, congenital and metabolic illnesses are commonly and increasingly seen. Many pediatric/children are also treated for conditions like Clubfoot.